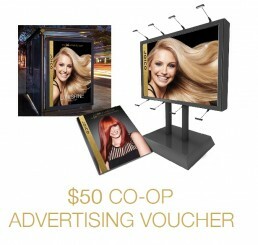 $50 CAD voucher to be used towards co-op advertising. Increase traffic in your salon! These days advertising isn't simply radio, television or print. Think about advertising online and on social media, like Facebook. AccessJoico points can be used towards a 100% cash reimbursement on pre-approved advertising. Please consult your Distributor Sales Consultant and/or Joico Educator for details. $100 CAD voucher to be used towards co-op advertising. Increase traffic in your salon! These days advertising isn't simply radio, television or print. Think about advertising online and on social media, like Facebook. AccessJoico points can be used towards a 100% cash reimbursement on pre-approved advertising. Please consult your Distributor Sales Consultant and/or Joico Educator for details.